Our motto is, “We’re not happy until you’re happy.” No money down and we work until the job is completed to your satisfaction. 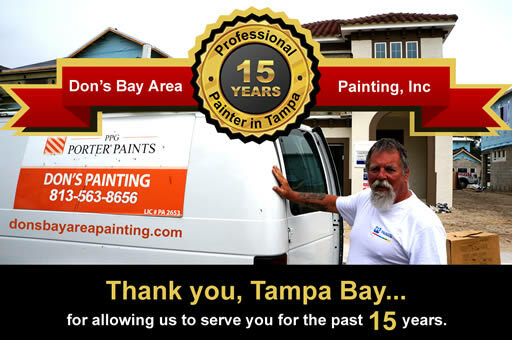 We specialize in painting homes and offices in the Tampa Bay area – a painting company you can trust. We’ll help you pick your colors and then paint a small sample area to ensure you’re going to love your new look. We include free pressure washing of your driveway and sidewalk with every exterior house painting. Painting the exterior of your house is no small task. You need to properly prep your home’s exterior such as repair stucco cracks, repair wood rot, seal joints and more. Before attempting to DIY, request a free, no-obligation house painting estimate from Don’s Bay Area Painting. Receive all the benefits of using a professional painting company. Painting the interior of your Tampa, FL home yourself can be very stressful. Tasks such as picking the best paint finish and paint colors; taping off the trim, ceilings, etc; protecting your floors and furniture; proper prep and painting techniques. Why bother? Hire a professional to take the guesswork out. No Mess, No Fuss, Done Right, Done Fast! 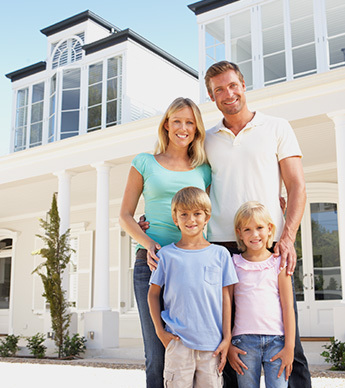 On the hunt for professional painting contractors in the Tampa Bay area that you can trust? Don’s Bay Area Painting is a local painting company with over 30 years experience. We have a full staff of in-house highly experienced, licensed and bonded Tampa painters who are trained on the latest painting techniques to ensure your house or commercial building is painted correctly and in a timely manner. Our estimates are flat-rate and all-inclusive which means the price we bid is the price you pay – not a penny more! We are so confident in your 100% satisfaction of our services that we do not require a deposit to start painting. That’s right! We do everything from the free estimate to prep work to painting and final touch ups, we do everything. Then, when you are happy with our work, you pay us for our painting services. Our painting services are available in Tampa, Brandon, Riverview and throughout all of Hillsborough County, Florida. Whether you’re looking paint the interior or exterior of your commercial building or residential home, we can handle your painting needs. Call Don’s Painting today and we would be happy to provide you with a free painting estimate. When you hire Don’s Painting to paint your house or building, your painting work will be backed by a five-year guarantee. We will match or beat our competitors’ prices. 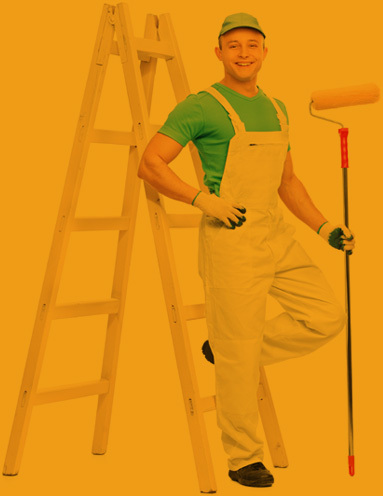 Already have painting estimates from other Tampa painting contractors? We will match painting estimates from local painters for the same quality of paint product and level of service. We take pride in the painting work we do. Our painting company has grown from customer referrals and repeat business. To ensure customers are happy with Don’s Bay Area Painting: We don’t require you to make a deposit; We work hard to finish your job quickly; We do a walk through with our customers to identify everything we’ve done and that it is to their satisfaction or else we fix it. Feel free to use the link below to view a photo gallery which demonstrates the quality of our work. Why Don’s Bay Area Painting? Our job is to get the job done fast and done right. We don’t jump from job to job. We start and finish your project. We don’t get paid until we’re done and you’re happy. Our motto is, “We’re not happy until you’re happy.” That means we do a personal walk through with you to ensure everything is done the way you want and you’re happy. We don’t give blind estimates. We visit your home or office building to get all the information we need to provide you a fixed bid painting estimate – No Surprises! Hire a painting contract that is bonded & insured to ensure your job will get done and that you’re not liable if one of our painters gets hurt on the job. Looking to hire a Tampa painter with experience? Don has over 30 years experience and each employee has 10+ years of experience to do the job right. Stucco and crack repairs, pressure washing, color matching, daily site clean-up etc. We’re here to do the job right to ensure you get the most out of your investment. We would like to express our sincere thanks to you for partnering with us in our 5K Run/Walk for your life...Or someone else's. The evening would not have been possible without your generous support, which helped us raise over $8000.00 for the American Cancer Society. This donation will touch many lives here in our community. Paint Color Consultation and New Look! Your consultation on the colors and painting style were so helpful and really changed the look of my house for the better. Thanks. Clean and Professional - Love the new look! Your men were so clean and professional! We love our new look! Thanks! Providing residential and commercial painting services to the greater Tampa area, specializing in the following cities in Hillsborough County, Florida. Look below to see if we’re in your communtiy or area.